This most interesting surname is of either Old French or early medieval German origin, and has three possible interpretations. Firstly, it may be of Old French origin as an occupational name for a scribe or copyist, from the Old French, Middle English "bulle", letter, document. Secondly, it may be a French habitational name, possible from "Bouille"; the "-er" may have arisen by analogy with other Norman placenames in "-iere". Finally, it may be of early medieval German origin, from the Middle High German "bullen", to roar, which was a nickname for a man with a loud voice. The surname first appears in the Church Registers of early German States in the 16th Century (see below). Other early examples of the surname include: the birth of a son to Peter and Klara Buhler, in 1588 at Arnstedt, Schwarzburg-Sonderhausen; and the marriage of John Buller and Phillippa Percyvell on April 14th 1603 at St. Nicholas's, Cole Abbey, London. 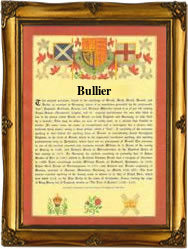 Interesting namebearers were Sir Francis Buller (1745 - 1800), justice of the common pleas, 1794 - 1800, and Charles Buller (1806 - 1848), an M.P., who was also secretary to the governor-general of Canada. The first recorded spelling of the family name is shown to be that of Thomas le Bulur, which was dated 1203, witness in the "Assize Court Rolls of Staffordshire", during the reign of King John, known as "Lackland", 1199 - 1216. Surnames became necessary when governments introduced personal taxation. In England this was known as Poll Tax. Throughout the centuries, surnames in every country have continued to "develop" often leading to astonishing variants of the original spelling.